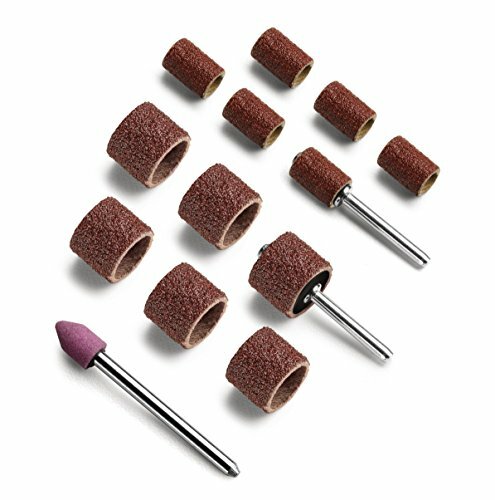 The Andis Pet Nail Grinder Replacement Accessory Pack has two sizes of sanding drums and bands make it easy to use on any size dog or cat breed. It has a finishing stone for final shaping and a smooth finish and is an easy and quick stress-free way to give your pet a perfect pedicure. Smoother, rounded nails keep your floors and furniture safe from scratches and with this accessory pack you save money by filing your pet's nails at home. No more cutting into the quick or rough edges that occur with nail clipping. Contains: one 1/4" sanding drum, one 1/2" sanding drum, six 1/4" sanding bands, six 1/2" sanding bands and one finishing stone.